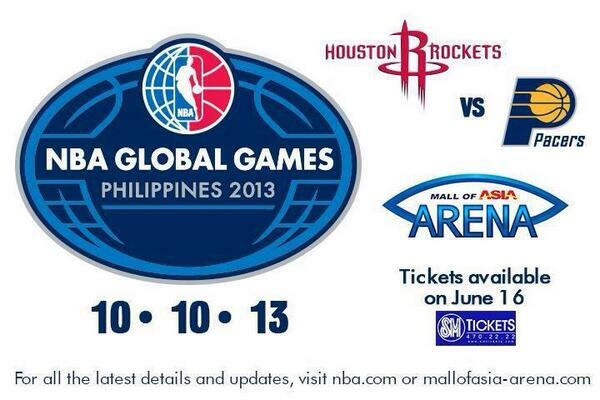 Manila, Philippines- Business Unit Head of MOA Arena, Mr. Arnel Gonzales on Friday announced ticket selling date and prices for the NBA Global Games Philippines (NBA pre-season game) between Houston Rockets and Indiana Pacers on October 10, 2013 at exactly 7pm at the SM Mall of Asia Arena. Ticket price range from P550 up to P32,300. Tickets will be available starting June 16, 2013 at 10:00am. A total of 16,000 tickets will be available for sale to the public. To reserve your tickets, please access: www.smtickets.com. Tickets also available at all SM Ticket outlets. Last March 5, 2013, MOA Arena management revealed the 'Big Thing' for Philippine basketball game history. Filipino basketball fans are now excited to see teams that will match on the historic sports fight which is considered to be the first in the Philippines and few in Asia.